The 21st century witnessed an exponential growth in the mobile industry. New technology and features are being incorporated in the smartphone industry. With such a rapid growth going on, there is a lot of potential in the same. Furthermore, growth is also bringing technology to the masses. As the penetration of these phones increases across the world, a number of opportunities are speculated to sprout. As CounterPoint Research writes, “Over the next three years, nearly 370 million smart feature phones are expected to be sold across the world, according to the latest research from Counterpoint Research. This will introduce an entirely untapped customer base to high-speed internet, apps and services and in doing so, open a whole host of new business and revenue opportunities for the entire mobile value chain“. There are a number of statistics backing up the said claim. Firstly, the cumulative revenue of the mobile industry is speculated to hit a whopping US$28 billion in the next three years. This will lead to a total of 300 million smart feature phone users by the year 2021. 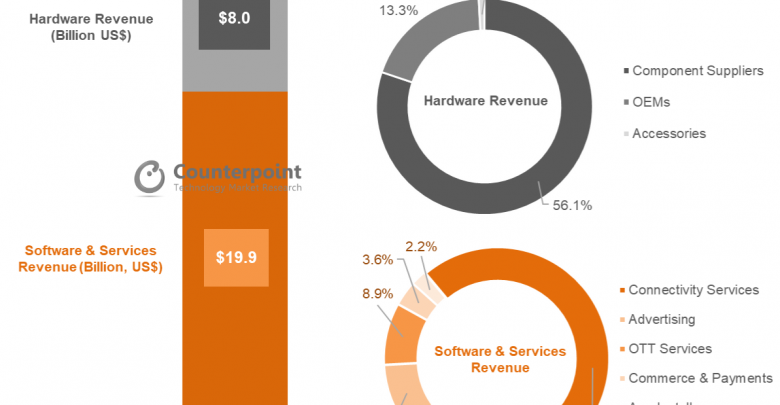 Software and services will be accounting for almost 71% of this revenue opportunity. The untapped customer base is what will play a pivotal role in the coming years. There are a lot of countries where the literacy rate is pretty less. Consequently, there is less awareness among that consumer base. Smart-feature phones will aim to bring accessibility to the consumer base. The less literate consumers are reluctant to get into tech-savvy phones. However, in the future things will be targeted towards them as well. “The global smart feature phone demand grew 252% year-on-year in 2018 – albeit from a low base, contributing roughly 16% of the total feature phone volumes”, says Tarun Pathak, Associate Director at Counterpoint Research. India remains the major contributor to this market demand rise. That is obviously due to the fact that the literacy rate in India is low, and gradually masses are getting exposure. With so much potential ahead, the smart-feature phone industry is something that is bound to boom in the coming days. It’ll be interesting to see how it changes the accessibility of technology as a whole to the masses. Moreover, network operators will benefit from this as well, as more users get connected to the 4g spectrum.